In the first volume of this New York Times Best Selling Graphic Books series, we have nothing to fear, but fear itself...and Zombies. 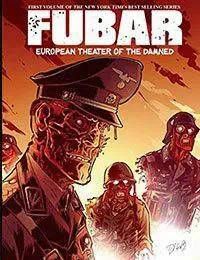 FUBAR is just another old-fashioned World War II Zombie anthology featuring 15 stories from a virtual army of Small Press creators. This Zombie-Nazi smashing book spans the entire European theater from Sussex to Stalingrad as the Allies come face to face with the walking dead.